My dad is coming to town. He recently retired and is ready to enjoy not working. It will be nice to see him. I'm sure he's wishing his oldest son would have chosen to live in a more tropical locale as Boise in December isn't tank top weather. The tree is up. We might have to hang it from the ceiling so it makes it to Christmas. As you can imagine, Ms. Frizzle thinks it's a giant chew toy. And I'm glad to announce that Ms. Frizzle has added Christmas ornaments to her diet. She might change her mind about her dietary choices after one of the ornaments make it through her system. I got a really good deal on a bag of clementines. Some days you really have to count your blessings. 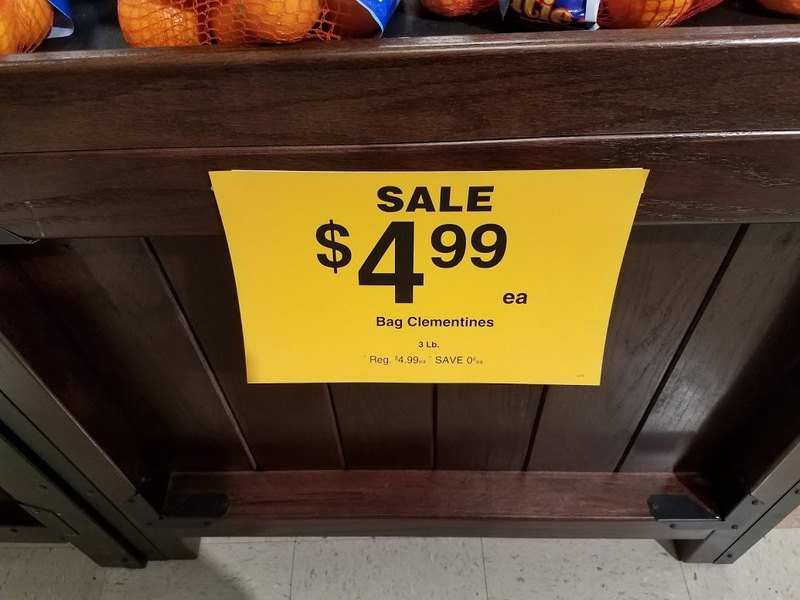 Thank you, Fred Meyer for the incredible savings. Some days you also hope that they will invent sarcastic font to remove all doubt that I was being facetious. Recommendation of the week: Towel shopping at Bed, Bath, and Beyond. So, so much fun. Did I mention that someone needs to invent a sarcastic font? It's really going to be fun when Mrs. Shife tells me she doesn't like them and I get to take them back. I am a man with only a few admirable qualities and towel shopping is definitely not one of them. broke the tree in half (6 mo. old puppies). above breed standard and 125 lbs. Having a dog in the house was a concern this Christmas with the tree. Thankfully, he has shown zero interest. Good luck with yours though. And I loved the joke. Definitely reading that one to my wife. They're all at the funeral! Ha!! Love it. Hope your dad has a good visit. And that your towels meet with approval. That clementine picture is great! I don't think we ever had a problem with our dog and the tree. But cats....a whole different story. Enjoy the time with your dad. I have never dared put up a real tree.... dogs and cats, you know. Loved this weeks post, you certainly know how to make me laugh. Keep up the good work. you got me smilin with the christmas tree story, ruby pulled a few down. i think the man made the right decision going to the world cup game.